One of the less desirable characteristics of small live steam locomotives is that they hurtle out of the starting gate, and even if you manage a light enough touch on the regulator to run them slow, they stall on the curves. I’ve already commented on the SSP Slo-mo which I admired when choosing which loco to buy. The Roundhouse Millie can’t be fitted with a slo-mo, but it can be coupled to a wagon with a flywheel, as demonstrated by Zach Bond who has fitted a very inexpensive toy into a ‘Momentum Van’ (see Garden Rail, subscription required) and has inspired many others to copy him (see Milford Hill, Garden Rails thread 1, thread 2, and now me). The toy, a “Zecar”, can be purchased cheaply from Amazon, so I decided to fit one to an IP Engineering wagon kit. Then I decided to fit two, because momentum is a Good Thing, and you can’t have too much of a Good Thing. The result is currently in an unfinished state, but it runs, and, with half a kilo of lead in it, transforms the running of my Millie. I’ve fixed the mechanism into the wagon ok, but it’s horribly ugly, so that will need disguising, and the wagon finishing. 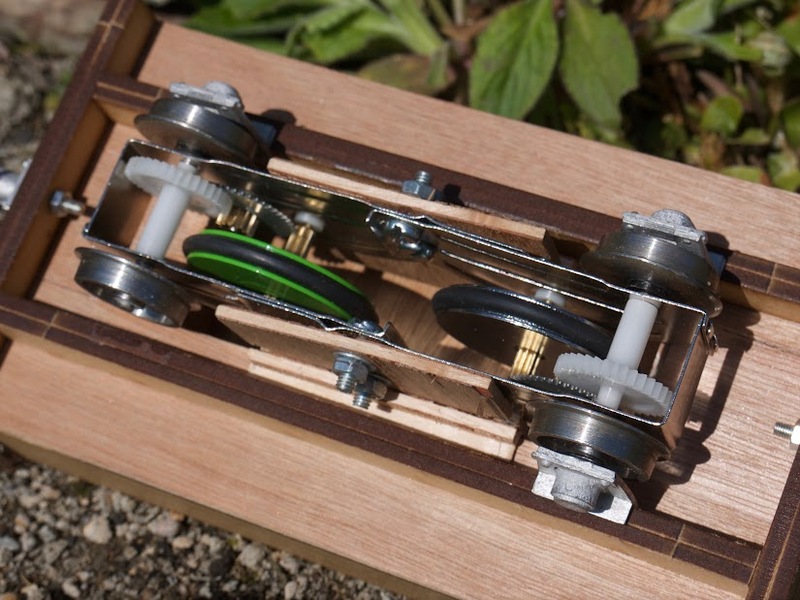 I also made a mistake in setting the sole-bars as if the axle boxes were going to function: but axles are supported by the Zecar mechanism and so the axle boxes, which are purely cosmetic, need to be set a millimetre or two further out. Ultimately, the transformation this simple addition has wrought has convinced me that any future steam locos acquired by the Moel Rhos Rly Co. will have to be capable of being fitted with an SSP Slomo, or at least a flywheel of some sort. The difference it makes is brilliant, why would I want to be without it? Good idea; increases the distance between axles too. I made one using one unit, and it ended up as a rather short goods van!